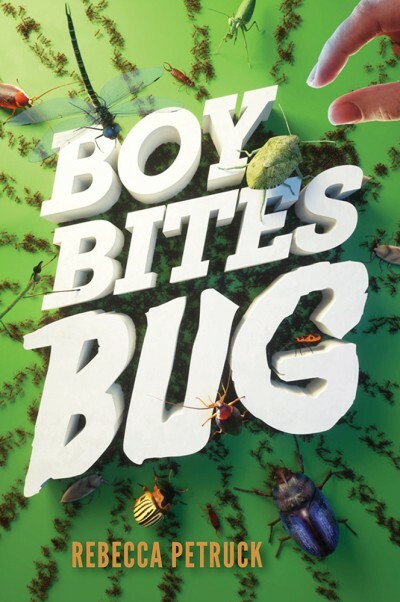 I love finding STEM-related fiction – especially when it involves insects. So I could not wait to read Rebecca Petruck’s newest book! Boy Bites Bug is about middle school and growing up, discovering who you are who your friends are. It’s also about wrestling, racism, and respect. And, of course, bugs – some swallowed by accident, some on purpose. This was the winter of the stinkbug invasion in our house, so I particularly loved the opening lines of the book: The intrusion of stinkbugs clumped on the ceiling in a back corner of the library, a splotch like crusty dried mud. Of course one of those bugs ends up in Will’s mouth! But instead of becoming an outcast, he becomes “bug boy”, and kids good-naturedly tease him by making up names for lunch items in the school cafeteria: French flies; maggot-aroni and fleas. Turns out that people all around the world eat bugs as part of their meals. They’re a great source of protein. So Will decides to do a class project on eating insects, and enlists the aid of Eloy Herrera. Eloy agrees, in exchange for Will’s help with wrestling. As their friendship grows, Will’s friendship with Darryl cools. Darryl had called Eloy a racial slur, and seems jealous of the time Will spends with his new friend. Meanwhile there’s wrestling practices and… where did that box of live crickets come from? I love that this book has back matter: a guide to eating bugs, and a few recipes. Author Rebecca Petruck even rustled up some grubs to taste test: waxworms in cookies, crickets in tacos, and earthworm jerky. Head over to Archimedes Notebook for an interview with Rebecca and more.